Dublin, 6 October 2016 | Ballymore Group (“Ballymore”), one of the largest privately-owned property groups in Europe, today officially launches its new docklands development, Dublin Landings. The launch event is taking place at the CHQ Building IFSC, Custom House Quay, Dublin 1 this morning. 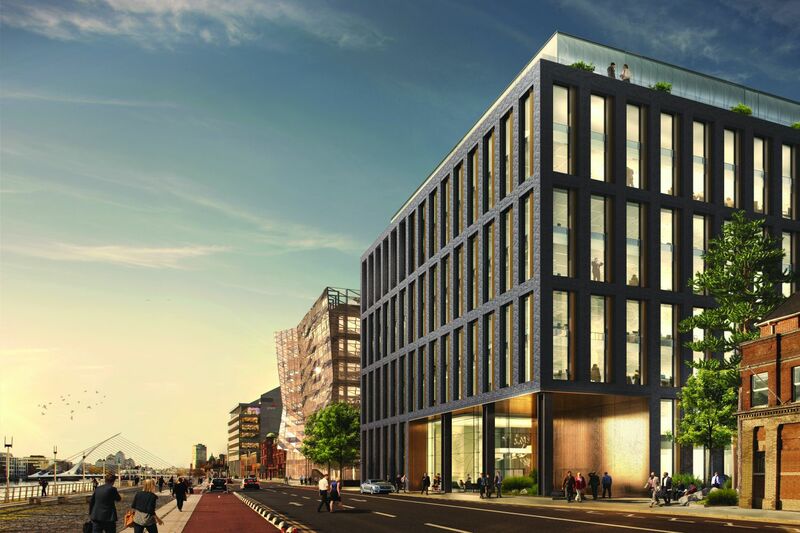 Situated along Dublin’s North Wall Quay, this ambitious project will raise the bar on architecture and landscape design to the standard of other global financial centres. The development rights for this 2.35 hectare site were secured by Oxley Docklands Quay Limited (“Oxley”) who have partnered with Ballymore to manage and deliver the project over the next four years. Ballymore and Oxley recently launched one of London’s largest and fastest selling mixed-use project, Royal Wharf, in a successful joint development.  Construction of No 1 and No 2 has already started, comprising 300,000 sq. ft.
 NTMA anticipated to be first tenant taking 83,000 sq. ft. The Dublin Landings development is superbly located in the heart of Dublin’s Docklands at City Block 8 on Dublin’s North Wall Quay, also home to the Central Bank of Ireland’s New Headquarters. With a Gross Development Value (GDV) in excess of €700 million, on completion, the site will comprise 700,000 sq. ft of Grade A office space, 273 luxury one, two and three bed apartments and a number of retail units. It will be home to 5,500 people who will live and work in the area, creating a vibrant new community in an exciting part of the city. Internationally renowned as an expert in Docklands development, and with a number of award winning docklands developments in London, Ballymore has set a new standard in Dublin with this mixed-use scheme. Designed jointly by RKD Architects and Arrow Architects, when constructed, Dublin Landings will create a unique and architecturally striking world-class urban quarter. In order to achieve the goal of creating a community within the Docklands, architectural variety, both in expression and materiality has been a key focus. The introduction of diversity has created a less polished version of the Docklands which reflects on the experience of Ballymore in London and Scandinavian design approach. Landscaping has been central to the development of the scheme, ensuring the creation of a distinctive city quarter with a sequence of spaces, streets and green pockets that people will use, love, protect and manage over many years. Ballymore Group is a family owned, international property development company with a reputation for innovative projects that push boundaries and energise cities. The Group was recently awarded ‘Large Developer of the Year’ at the prestigious RISI awards in London. Ballymore has the scale is that of a heavyweight developer, but retains the integrity of a family business. Believing in building developments that improve, enrich and enhance people’s lives, and has proved time and time again that it’s smart business sense to do so. The name Dublin Landings has been derived from the deep history rooted in the North Docklands area. From the landing of the Vikings in 708 up to the history with the United Irishmen, the site has witnessed the birth and growth of Dublin City. Today, Dublin Landings represents the arrival of a new generation of talent as the Docklands area continues to thrive. For Ballymore, the naming of a scheme is equally important as any other element as it shapes the future of the area. Dublin Landings celebrates a new era in Docklands development for Dublin.